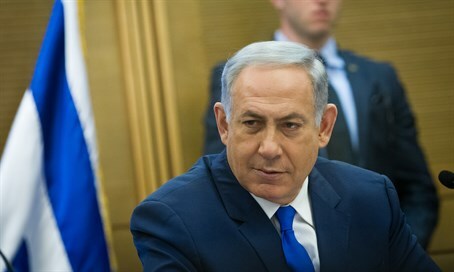 Prime Minister Binyamin Netanyahu on Monday celebrated a recent report listing Israel as the 8th most powerful country in the world during a Likud faction meeting. The report was published by US News & World Report last month, and was conducted together with BAV Consulting and the Wharton School of the University of Pennsylvania, based on a survey of 16,000 people from four regions who were asked to associate 60 countries with specific characteristics. It found that while Israel came out an overall 25 out of the 60 total, in the field of "Power" Israel came in 8th. The Power subranking lists a country's power in terms of being a leader, being economically influential, politically influential, having strong international alliances and a strong military. "Israel was ranked as the number eight power in the world based on three things: military power, international influence, and - pay attention, this is what they say - international alliances. It isn't me who chose to say that," said Netanyahu as reported by Yedioth Aharonoth. "They rank us on our international power and our international alliances," emphasized Netanyahu. He did not note that the same report ranked Israel as 25 overall. It ranked Israel 21 in terms of Entrepreneurship, and 34 in Quality of Life. In the Power subranking, Israel came behind the US which ranked as number 1, followed by Russia, China, Germany, the UK, France and Japan in that order. "For a long time I've been telling you that we are witnesses to two trends - (one is) the front of delegitimization of the state of Israel, and we are fighting it. Another front is the strengthening of the alliances of the state of Israel," said Netanyahu. He noted that today he met with the Egyptian ambassador, as well as with African ambassadors "to strengthen the union between the countries of Africa and Israel. He also noted that US Vice President Joe Biden is due to visit soon, adding, "we are strengthening ties with many world powers in Asia and Latin American countries, and that's what we're doing all the time, every day."